– Anthropological influences: a translation of the section `Anthropologische invloeden’ of the chapter Typen van toverij (Types of witchcraft) in: Peter te Boekhorst, Peter Burke & Willem Frijhoff (eds), Cultuur en maatschappij in Nederland 1500-1850. Een historisch antropologisch perspectief. Meppel/Amsterdam and Heerlen (1992): 319-363, esp. 331-334. – the paragraph on `The Researcher’s Position’ in: The Witch, her Victim, the Unwitcher and the Researcher. The Continued Existence of Traditional Witchcraft, in: Willem de Blécourt, Ronald Hutton & Jean La Fontaine, Witchcraft in Twentieth-Century Europe. London, Athlone (1999): 141-219, esp. 154-158. – my reaction to Ed Bever’s The Realities of Witchcraft, in: Magic, Ritual and Witchcraft 5 (2010): 103-107. The main focus of this page, however, is to give an overview of my work on witchcraft in English and German; I started with writing articles in Dutch (original English summaries are included). There are brief references to the Dutch context if necessary. I have studied anthropology at the University of Amsterdam where courses included witchcraft. These were, however, all about witchcraft in various regions outside Europe. When I discovered that witchcraft had been a regular feature of local Dutch history, I had found one of my main areas of interest. My Ph.D. thesis, defended at the Erasmus University in Rotterdam, focused on five centuries of witchcraft in the Dutch province of Drenthe. It was published as Termen van toverij: de veranderende betekenis van toverij in Noordoost-Nederland tussen de zestiende en twintigste eeuw. Nijmegen, SUN, 1990. In English it translates as Words of Witchcraft: the changing meaning of witchcraft in the northeastern Netherlands between the sixteenth- and twentieth centuries. The original English summary is included here. – sample fragment on the academic use of `witchcraft’ and similar terms. – Evil people, see below under Beyond conference. – The male witch. An essay on the meaning of seventeenth-century witchcraft insults (1991): unpublished. – Hexenfamilien – Zauber(er)geschlechter. Das Beispiel Drenthe (17.-19. Jahrhundert), in: Eva Labouvie & Ramona Myrrhe (eds), Familienbande – Familienschande. 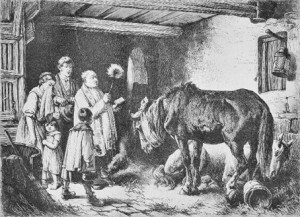 Geschlechterverhältnisse in Familie und Verwandtschaft. Köln/Weimar/Wien, Böhlau (2007): 121-145. – Kwade mensen: toverij in Nederland, edited by Marijke and myself. Amsterdam: Meertens Instituut (1986). – Nederland betoverd: toverij en hekserij van de veertiende tot in de twintigste eeuw, edited by Marijke and Willem Frijhoff. Amsterdam, De Bataafsche Leeuw (1987). – Toverij in Nederland, edited by Fred Matter. Amsterdam: Meertens Instituut (1990). – Witchcraft in the Netherlands from the fourteenth to the twentieth century. [Rijswijk:] Universitaire Pers Rotterdam (1991). – (with Hans de Waardt), “It is no sin to put an evil person to death”. Judicial proceedings concerning witchcraft during the reign of duke Charles of Gelderland: 66-78. – (with Freek Pereboom), Insult and Admonition: Witchcraft in the Land of Vollenhove, seventeenth century: 119-131. – Four centuries of Frisian witch doctors: 157-166. – (with Hans de Waardt), Das Vordingen der Zaubereiverfolgungen in die Niederlande: Rhein, Maas und Schelde entlang, in: Andreas Blauert (ed. ), Ketzer, Zauberer, Hexen. Die Anfänge der europäischen Hexenverfolgungen. Frankfurt am Main, Suhrkamp (1990): 182-216. – Mangels Beweisen. Über das Ende der Verfolgung von Zauberinnen in Niederländisch und Spanisch Geldern 1590-1640, in: Sönke Lorenz & Dieter R. Bauer (eds), Das Ende der Hexenverfolgung. Stuttgart: Franz Steiner Verlag (1995), 77-95. – On the continuation of witchcraft, in: Jonathan Barry, Marianne Hester & Gareth Roberts (eds), Witchcraft in Early Modern Europe: Studies in Culture and Belief. Cambridge, CUP (1996): 335-352. – The witch, her victim, the unwitcher and the researcher. The continued existence of traditional witchcraft, in: Willem de Blécourt, Ronald Hutton & Jean La Fontaine, Witchcraft in twentieth-century Europe. London, Athlone (1999): 141-219. – The making of the female witch: reflections on witchcraft and gender in the early modern period, Gender & History 12 (2000): 287-309. – The Flying Witch: Its Resonance in the Sixteenth-Centurty Netherlands, Magic, Ritual, & Witchcraft 11 (2016): 73-93. – The Laughing Witch: Notes on the Relationship Between Literature and History in the Early Fifteenth Century, in: Louise Nyholm Kallestrup & Raisa Maria Toivo (eds), Contesting Orthodoxy in Medieval and Early Modern Europe. Heresy, Magic and Witchcraft. London: Palgrave (2017), 255-277. – Beyond the witch trials. Witchcraft and Magic in Enlightenment Europe. Manchester, MUP (2004). – Witchcraft continued. Popular magic in modern Europe. Manchester: MUP (2004). Both books can be found online. – ”Evil people”: a late eighteenth-century Dutch witch doctor and his clients, in: Beyond: 144-166. – Introduction: witchcraft continued: 1-13. – Boiling chickens and burning cats: witchcraft in the western Netherlands, 1850-1925, in: Continued: 89-106. Organized in April 2010 by Cornelie Usborne at the German Historical Institute, London. – Volksmentaliteit or elitaire constructie?, Sociologisch tijdschrift 11 (1984): 555-560. – Spuren einer Volkskultur oder Dämonisierung? Kritische Bemerkungen zu Ginzburgs “Die Benandanti”, Kea. Zeitschrift für Kulturwissenschaft 5 (1993): 17-29. – The return of the sabbat: mental archaeologies, conjectural histories or political mythologies?, in: Jonathan Barry & Owen Davies (eds), Witchcraft historiography. Basingstoke, Palgrave (2007): 125-145. – A journey to Hell: reconsidering the Livonian ”Werewolf”, Magic, Ritual & Witchcraft 2 (2007): 49-67. – Revisiting the Sabbat, or: The Dance of the Cats. Sixteenth Century Society Conference, Genève, 29 May 2010. – Meetings on the Outside: Further Notes on the Histories of the Sabbat. Konferenz Grenzüberschreitungen. Magieglaube und Hexenverfolgung als Kulturtransfer , L’Institute historique allemand, Paris, 21 May 2010. – Stories of the Sabbat. Hexensabbat. Tagung Arbeitskreis für Interdisziplinäre Hexenforschung, Weingarten, 28 Juni 2013. Sabbath Stories: Towards a New History of Witches’ Assemblies, The Oxford Handbook of Witchcraft in Early Modern Europe and Colonial America, edited by Brian Levack. Oxford, OUP (2013): 84-100. – Night Elves: Mistresses of the Night, Good Beings and an Innumerable Multitude of Women). 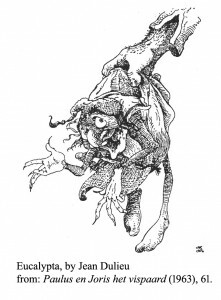 – From Elves to Witches: Narrative Transitions in Early Modern and Modern Europe. (Both titles are provisional). A table of contents will follow soon. 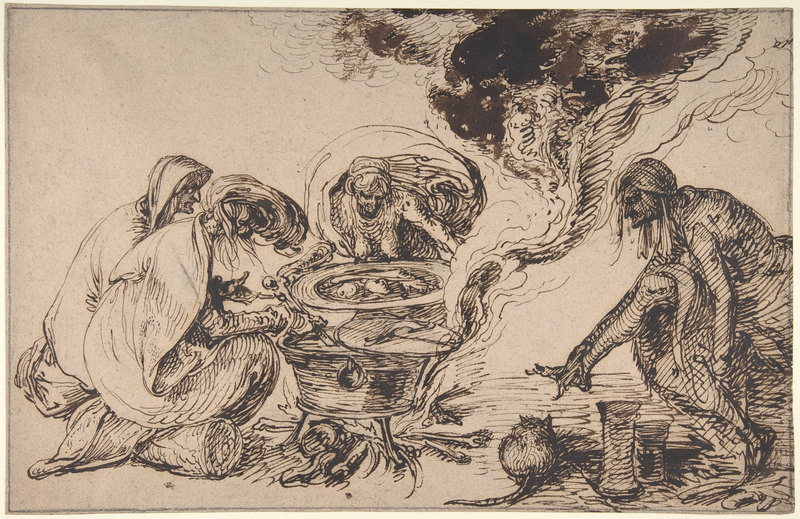 Jacques de Gheyn II, The Witches’ Kitchen, drawing ca. 1600. Witchcraft in the Low Countries. This is an ongoing book project, but I am making some progress. See proposal. – Witches on Screen, in: Owen Davies (ed. ), The Oxford Illustrated History of Witchcraft and Magic. Oxford: OUP (2017), 253-280.